Hide deals from seller "Tuff Enuff Pet Products"
Click ‘Get It’ and select color choice. Limit 1 per person; may purchase 1 additional as a gift. Valid on (1) 7-inch Tuff Disc and (1) 8-inch Tuff Bone for small dog breeds. Shipping fee of $5.50 not included. Tax added at checkout. All products are Final Sale. Most orders ship within 7 business days of order date. Must provide name and shipping information at checkout, which will be shared to facilitate shipping. Contact Deals Magazine for any qustions or comments. Product will be mailed to you. 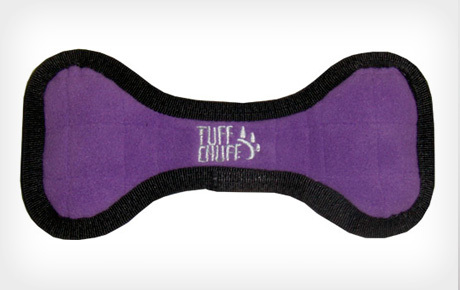 Let your pooch enjoy hours of entertainment with 50% off Tuff Enuff Dog Toys for small dog breeds ($22 value). You will get a 7-inch Tuff Disc and an 8-inch Tuff Bone, perfect for both indoor and outdoor adventures. Deals Marketplace connects shoppers with deals on products to help them live, work and play. Enter shipping address at checkout and product will be mailed to you.